Our new article over at MacDevCenter! What would be the coolest part of a Dyson Geekosphere? Isolation from distracting and annoying reality. The outer surface. The Dyson Geekosphere's outer surface area is much larger than that of the occupant's, therefore it radiates heat away at a much lower blackbody temperature. Being able to stuff several per cubicle for maximum efficiency. 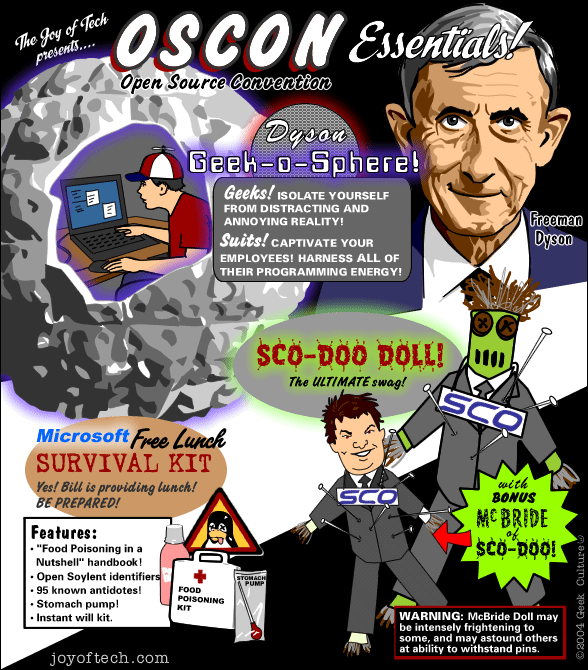 Anything related to Freeman Dyson is cool in my books. Anyplace that can hide me from that McBride of SCO-doo Doll is desirable. quantumfluff gets the Best compliment ever , ... GMx reveals Hawking Changes His Mind , ... Groggle ponders Have classical churches lost their relevance? , ... The Famous Druid thinks army food has sunk to a new low, ... CrawGator reports on You Lucky Canadians , speaking of which macmcseboy shows off Hot Island PIX ... Mark Shapiro loves his G4 Pismo. , ... and Snaggy floats Maybe the TTBs would like to buy it? And in SuperFan Clubhouse Tidbits: SuperFans unite and celebrate Allan's birthday!